"God makes the best roller coasters." If life is indeed like a roller coaster ride, well, after an amazing ride to the top in June, it went downhill the moment July said hello. So, I woke up with an aching body on the first Thursday of the month, but I thought nothing of it cause I had been exercising rigorously the couple of days back. Headed to work as usual, by the time I reached my office, I was feeling feverish and my colleagues were commenting that I looked sick. Indeed, I was feeling worse as the clocked ticked by, but I didn't want to cancel a meeting that was scheduled for that afternoon, so all I did was popped two paracetamol and hoped that the fever would go off. By lunchtime, I was feeling in the dumps. Not only did the fever not subside, it got worse. Luckily for me, the meeting got rescheduled cause the other party couldn't make it so I decided to take the afternoon off to pay my GP a visit. His diagnosis was influenza, the worst form of flu. I was running a high fever when he saw me, and the body aches were so bad that I had problems walking. That night, I slept at 8.00pm. Friday morning came, and the fever showed no sign of subsiding so the whole day was spent in bed. Then Saturday arrived, the day of Stefanie Sun's Keplar World Tour Concert. I was wondering if I should skipped the concert but I was feeling better so I decided to attend since I had already paid for it. Sunday arrived and I was feeling much better and all ready to head back to work the next day. So, imagine my horror when I woke up on Monday morning to find my face covered with rashes. That meant my medical leave was extended. My GP diagnosed the rashes as a result of the influenza and sent me home with medication for allergy and rashes. Woke up on Tuesday morning feeling tired and weak, but decided it was time to head back to work since my medical leave had ended. Had a hard time concentrating at work cause I was feeling feverish and the rashes were causing an itch. I had never been more thankful by the time the clock stroke 6pm. As the night went on, the rashes had gotten worse and the fever was back with a vengeance. By midnight I decided I had enough and made my way to the Accident & Emergency (A&E) unit of Alexandra Hospital. At that moment, all I wanted was to know what was happening to me. The symptons were similar to that of dengue fever but the blood test was negative. In the end, the doctor's diagnosis was drug allery. To PARACETAMOL! I was bewildered cause I had been taking paracetamol/Panadol all my life and never had this happened to me. Since that was his diagnosis, well, I took it as that and after lying in the A&E unit for close to 4 hours, I was sent home with 3 days medical leave and medication. Despite taking the medication and sleeping through the whole of Wednesday, I was not getting any better. Woke up on Thursday to a rashes covered and swollen face, raging fever and aching body. Mummy Love was pretty worried by now and suggested that I go back to my GP, but I told her that it was better to go back to the hospital. The moment I alighted from the cab, I was hunched over and about to faint any time. The hospital staffs rushed over and I was put on a wheelchair, had my temperature taken (a soaring high of 39 degrees) and wheeled to the A&E ward immediately. I didn't even had to register and go through triage. This time round, a senior doctor came to see me and after asking endless questions, his initial diagnosis was a viral infection, I was seriously dehydrated and I had to be admitted. I thought that was the end of it but I was wrong. The doctors suspected I had contracted measles and my case was transferred to the Infectious Diseases team. I also had to be isolated because measles was contagious, at that time I no longer cared where they put it. I only wanted to recover. Because I was dehydrated, I was put on IV drip and I slept for 3 days, waking up only when the nurses had to take my blood pressure and for medication. There were times when I didn't even wake up for meals cause I had no appetite. There is no cure for measles, so the doctors could only treat me by the symptons. Thankfully, by Sunday, the fever had subsided and I felt hungry, but I was still tired and weak and I was sleeping most of the time too. Monday came, and I was feeling way better. The rashes on my face and body were clearing, no more fever and body aches and my appetite had returned. The senior doctor came by and informed me that I was recovering, and I found out that I had contracted measles. From where or whom, I had no idea. I was also informed that I could be discharged the next day but would have to be on hospitalization leave till 22 July 2014. This pretty much explains my absence here and on Instagram. I practically slept through half of July and this had been one horrifying episode. During my stay at the hospital, there were times when I cried, especially when I saw my reflection in the mirror. I resemble a puffer fish and I'm not joking when I said that. The times when the nurses took my blood, only to have blood vessel moved before they finished and had to repeat the whole procedure again. The times when I couldn't open my eyes because they were so sensitive to light. I literally spent the first 4 days at the hospital in darkness. The times when I couldn't see properly; blurred vision and extremely dry eyes; I wondered if I would ever see clearly again. 20 days from the first day I came down with fever, I've finally recovered, not fully though. The older generation believes that it takes about a month to fully recover so I'm almost there. Extremely thankful to Mummy love, and the hospital staffs (especially the nurses at Ward 8) for taking care of me during this period. Especially Mummy love. She visited me twice a day, brought me food and herbal tea, and made sure I was feeling all right before she left home. Every night I would update her about my condition to lessen her worries. I'm also thankful for my relatives', my close friends and colleagues' concern. Many had wanted to visit me but I forbade them to do so; I wasn't in the state to see anyone and measles are contagious, I definitely didn't want anyone to get infected, especially those who are pregnant or come into contact with children. Looking on the brighter side, this period allowed me to rest and catch up on sleep. Cleared my sleep debt and if there's such a thing as sleep surplus, or can store sleep, I had about 80 hours by the time I got discharged. Now that everything is over and I've almost recover, it's time to get back on track with life. 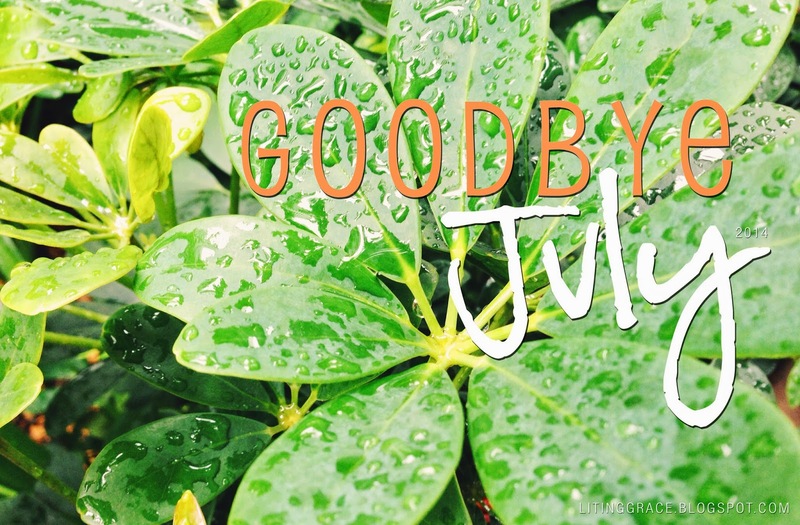 As July comes to an end soon, I hope that August will be a better month, and I wish for good health and happiness for everyone. Till the next, stay safe and healthy!